For over 35 years, Masterpiece fans have enjoyed dramatic and puzzling crime stories on PBS. Now you can treat yourself in honor of your favorite Mystery! 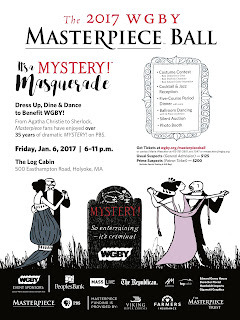 sleuths, from Agatha Christie’s Miss Marple and Poirot to the new Sherlock while supporting public television in western New England at the same time. Get into character. 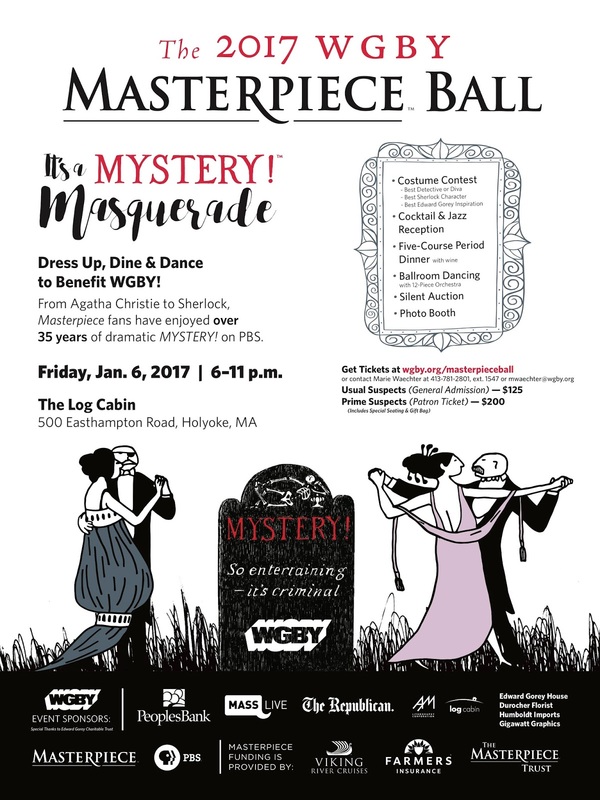 Part of the fun of the Masterpiece Ball is donning thematic garb (in this case, your favorite Mystery!-inspired character). Make sure your fancy costume is dance floor-ready. Don’t be afraid to go all out either — there will be a costume contest. Costume contest categories will include Best Detective or Diva, Best Edward Gorey-Inspired Costume, and Best Sherlock Character. Bring your appetite. The night will begin with a cocktail jazz reception, complete with hors d'oeuvres. Then, it’s on to a full, five-course meal with wine and sweet desserts. Be ready to move. The 12-piece Masterpiece Ball Orchestra will inspire trained ballroom dancers and novice party boogiers alike to kick up their heels. Bring your dance shoes for an extravagant night of music and movement. During its forty-year storied history — the longest-running prime time drama in American television — Masterpiece has remained steadfast in its commitment to bring the best in literature-based drama, mysteries filled with eclectic characters, and groundbreaking contemporary works. Funding for Masterpiece is provided by Viking River Cruises and Audible with additional support from public television viewers and contributors to The Masterpiece Trust, created to help ensure the series' future.